- Text reads: "There's too much blood in my Caffeine System". Let's be honest now… we can all related to this, right? I mean, the day doesn't really start until the 3rd or 4th cup of coffee! You'll have other drivers laughing and nodding their heads in agreement with this funny bumper sticker. 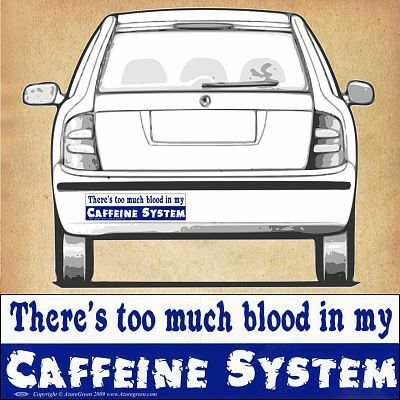 "Caffeine System" bumper sticker measures 11 1/2" by 3". This high quality vinyl decal is resistant to UV and water, and is made to last. Give everyone a piece of your mind as you drive down the road. Bumper stickers are the perfect little bits of wit and wisdom to share with the world. Do you have any other questions about our "Caffeine System" Bumper Sticker? A wonderful gift for the coffee drinker in your house! My wife could'nt wait to put this bumper sticker on her car.